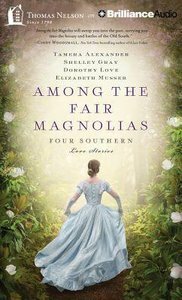 Four Southern women stand at a turning point in history...and in their own hearts. The Civil War cost Savannah Darby everything--her family and her home. When Aidan Bedford, an attorney from Boston and a former Union soldier, buys the Darby Farm, Savannah is assigned to redecorate. But the clock is ticking. Can she find the treasure her father hid there during the war before her job is finished? Join four bestselling authors as they invite you to step back with them into the 19th century, into a time in our nation's history when women were beginning to ask not only "What if?" but "Why not?" About "Among the Fair Magnolias (Unabridged, 10 CDS) (Four In One Auction Fiction Series)"
Tamera Alexander is the critically acclaimed author of Rekindled, her first novel. Before turning to writing full-time, Tamera Alexander's professional background was in business management and corporate conference coordination. A business graduate of Harding University, Tamera lives with her husband and their two teenagers in Greeley, Colorado. A native of west Tennessee, Dorothy Love makes her home in the Texas hill country with her husband and their two golden retrievers. An accomplished author in the secular market, Dorothy makes her debut in Christian fiction with the Hickory Ridge novels.